A rectifier is an electrical device consist of one or more diodes allows the flow of current only in one direction. It basically converts alternating current into direct current. 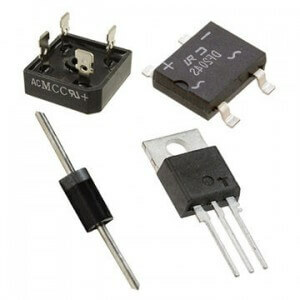 Rectifiers can be mould in several forms as per requirement like semiconductor diodes, silicon controlled rectifiers, mercury arc valves, vacuum tube diodes etc. In our previous articles, we explain diodes, types of diodes in detail. In this article, we are going to explain rectifiers, rectifier circuits, applications etc. For signal detection and power rectification, diode rectifier circuits are widely used in electronic circuit design. These are used in various devices includes radio signals or detectors, Dc power supplies, household appliances like laptops, video game systems, televisions etc. For economical reasons, the electrical power is transmitted, distributed and generated as a.c i.e. alternating voltage available at the mains. Sometimes most of the electronic circuits need d.c voltage for their operation, for that purpose all electronic equipment includes a circuit that converts a.c voltage of main supply to d.c voltage. This circuit is known as known as Power supply. The Power supply is the most important circuit of all electronic and electrical circuits. Without this all devices are useless. The block diagram of the power supply is shown above. At the input of the power supply, a transformer is used to step down the voltage as per requirement is known as the power transformer. After stepping down the voltage, this output becomes the input of the next block i.e rectifier which converts this a.c to dc voltage. This pulsating d.c is fed back to the filter circuit which removes the spikes, pulsations and smoothes it out. After filtering, this d.c is fed back to the regulator which obtains regulated d.c at the output. In half wave rectification, when a.c supply is applied at the input, only positive half cycle appears across the load whereas the negative half cycle is suppressed. In a single phase supply, it requires a single diode while in a three phase supply it requires three diodes. It is not efficient because only half of the input waveforms reaches the output. To reduce the ripples or to eliminate the harmonics of the AC frequency from the output, more filtering is needed in half wave rectifier circuit. In full wave rectification, during both the half cycles when a.c. supply is applied to the input , current flows through the load in the same direction. Full wave rectifier circuit yields a higher average output voltage by changing the both polarities of the input waveform to pulsating DC. This type of rectification can be achieved by using at least two crystal diodes, conducting current alternatively. During positive as well as the negative half-cycle of the input AC the following two circuits namely centre tap full wave rectifier and full wave bridge rectifier is employed to obtain the same direction of flow of current in the load resistor. Centre tap rectifier circuit employs a transformer with secondary winding tapped at the centre point. Two diodes are connected in the circuit so that each one of them uses one-half cycle of the input AC voltage. For rectification, one diode utilises the ac voltage appearing across the upper half of secondary winding while other diode uses the lower half of the secondary winding. The output and efficiency of this circuit are high because AC supply delivers power during both the halves. Bridge rectifier circuit is one of the efficient forms of full wave rectifier that utilises four diodes in a bridge topology. In place of centre tap transformer, in this case, an ordinary transformer is used. The AC supply to be rectified is applied to the diagonally opposite ends of the bridge and the load resistor is connected across the remaining two diagonally opposite ends of the bridge. The comparison between different rectifiers on the basis of various points are tabulated below.